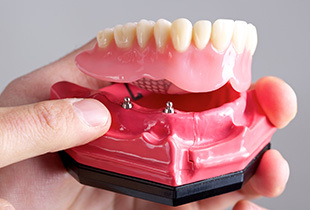 Today, dentures are no longer the only option for patients who’ve sadly lost one or more of their natural teeth. Dental implants are a state-of-the-art alternative that blows traditional solutions out of the water, providing incredible longevity, revitalizing health benefits, seamless function and appearance, and much more. Better yet, Dr. Atsalis has the advanced training needed to perform every step of treatment here in-office instead of having to refer you to an outside specialist. Contact Atsalis Dental Excellence in Plymouth today to schedule your first consultation. A dental implant is a high-quality, titanium post that is designed to resemble your original tooth root. Without a functioning tooth root in place, the jawbone structure can begin to deteriorate over time, which can lead to serious problems with both your appearance and overall oral health. Thankfully, implants revitalize jaw health and create an enduring foundation for lifelike replacement teeth to be anchored on top of. After Dr. Atsalis has helped you confirm that dental implants are, in fact, the right tooth replacement solution for your unique smile, the first major step of the procedure is the surgical placement of said implants into the jaw. While general dentists typically need to refer this specialty procedure to a separate doctor, our team is proud to offer the service right here in our Plymouth practice in order to keep our patients comfortable and save them valuable time. 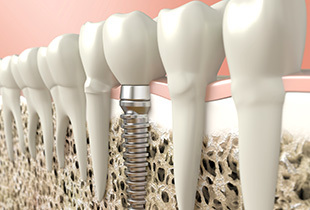 After the implant or implants are successfully seated in the gum tissue and bone, the body’s natural impulses will take over in the form of osseointegration. This process involves your natural tissue gradually forming around the implant(s) and creating strong bonds, which set the stage for new restorations to be anchored on top. 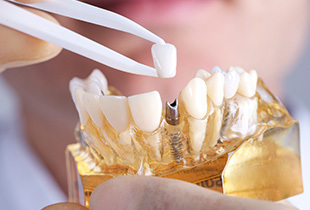 Once a patient’s mouth has fully healed from the initial implant procedure, it will be time to anchor custom-made, tooth-colored restorations over them in order to complete the smile. Our practice offers dental crowns for restoring individual implants and implant-retained bridges that are meant to replace consecutive teeth with the help of two implants on either side of the gap. Additionally, if you’re looking for more comprehensive coverage, a customized All-On-4 prosthetic may be right for you! All-on-4 is an excellent reconstructive choice for patients who have lost a full arch of natural teeth. Like its name implies, your new prosthetic will be anchored with just 4 implants that are strategically placed at an angle within the jawbone. This prosthetic is always custom-made to suit the patient’s unique mouth, and it can be placed over the implants immediately after they’re inserted in most cases. As a result, patients are able to enjoy stronger oral function and improved health – it may even take a few years off of their appearance as well!